Workspaces allow you to save a set of tabs (TabLists) including their authentication state to return to later with one click. Workspaces can still be managed from the Ghost Menu (icon to the left of the address bar) but include a lot of exciting. We'll add more exciting and helpful features to the Sidebar and Workspaces in upcoming releases! You can save tabs to a Workspace in two ways; Start a new blank Workspace for a clean workspace and add tabs to it, or Duplicate a current Workspace. Using the Sidebar, click the + sign from the menu. 2. Name your Workspace and hit the Enter key. A new blank Workspace will open. You can open tabs in your browser as normal and they'll be automatically added to your new Workspace. Hover over the Workspace you want to duplicate and click the overflow menu (3 dots) that appears. 3. Name your Workspace and hit OK. 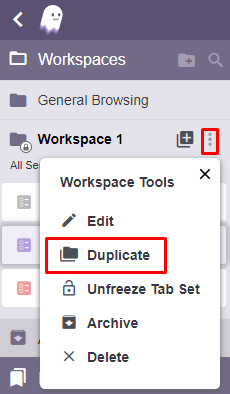 In this example above, the tabs opened in the "Workspace 1" Workspace have been duplicated and saved as your new Workspace. You can now edit the new Workspace to fit your needs. Your Workspace will briefly close and the duplicated Workspace will open under the new Workspace name. 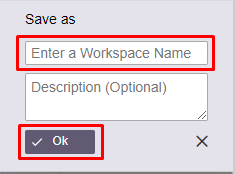 To re-order the Workspaces in your Workspace List, click the Workspace title and drag-n-drop your Workspaces in the order you want them to appear. 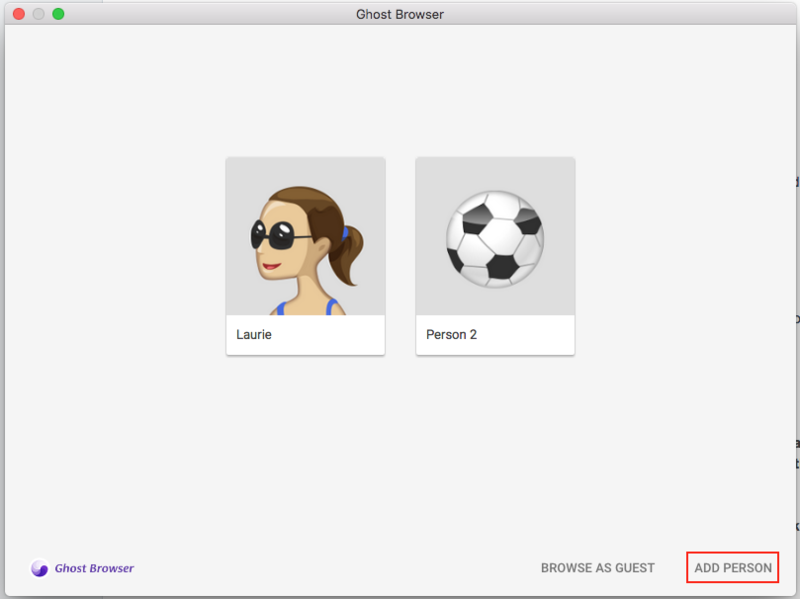 Ghost Browser defaults to allow you to open one Workspace at a time because Workspaces are designed to keep you focused on a single task at a time. However some users expressed a desire to open more than one Workspace at once, so we created a workaround for this. Note that the current limit to the number of Sessions you can open at once is 25, we increased this number. In the meantime, you can open more than 25 Sessions by opening multiple Workspace at once. Note: This feature is available to Premium customers only. 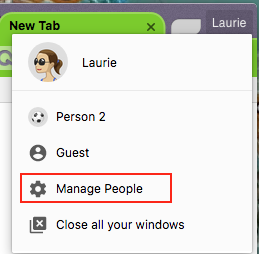 Click the Profile Manager in the upper right-hand corner of the browser and select Manage People. Note: If you want to use a previously created profile, simply select that profile here. Click Add Person to create a new profile. Enter the name for the new profile, choose an icon for the new profile (optional), and then click Add. 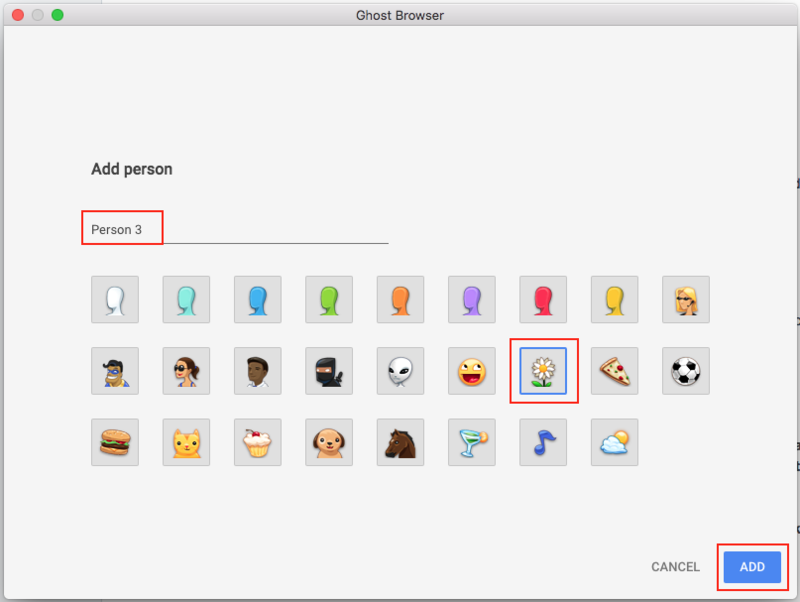 A new Ghost Browser Workspace opens within the new profile. You can now open a second Workspace in that second profile. Note: The new profile is also added to the profile list that appears when you click the profile icon. Workspaces from one profile are not visible to Workspaces in another profile, so keep this in mind when organizing your work. 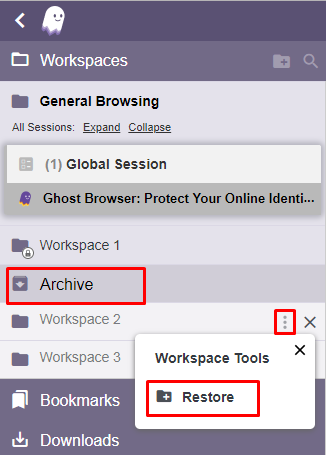 As you work in any of your Workspaces, Ghost Browser saves that particular Workspace's history. 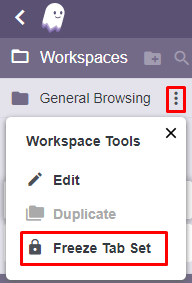 So if you open a Workspace that has five tabs, then add 3 more tabs while working, the Workspace will now have those same 8 tabs the next time you open it. This is an Un-Frozen TabList, meaning the list of tabs in your Workspace is subject to change as you're working. This is ideal for Workspaces you want to use with a "pick up where you left off" experience. 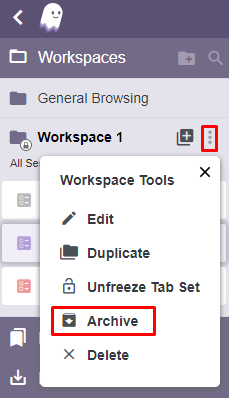 If you have a Workspace with 5 tabs and Freeze that TabList, then it will always have those 5 tabs when you open that Workspace, regardless of what you do while working in it. This is ideal for Workspaces you want to use with a boilerplate experience, sort of like a checklist for repeatable tasks you complete on a regular basis. 1. Hover over the Workspace you want to Freeze and click the overflow menu (3 dots). 2. Select Freeze Tab Set from the menu. You'll now notice a lock icon to the left of the Workspace name indicating the Tab Set in that Workspace is Frozen. Want to Un-Freeze the Tab Set in your Workspace? Follow the same instructions above but this time select, Un-Freeze Tab Set. You'll notice the lock icon is no longer present next to your Workspace name indicating that the TabList in that Workspace is no longer Frozen. When you create a Workspace, you're saving a series of tabs and Sessions that you use frequently. For example, if you’re a social media manager with three clients, you can open all of your client's social media pages in different Sessions, log into all of them and save them all as one Workspace. By default, when you open an Un-Frozen Workspace, Ghost browser displays the tabs that were open when you last closed the Workspace, even if that means you had 50+ tabs when you last closed the Workspace. Freezing a Workspace allows you to return to a particular state for a set of tabs and Sessions, no matter where your browsing journey takes you. If you Freeze a Workspace that displays the Twitter Notifications tab for 6 of your clients' accounts, even if you open 30 more tabs before closing that Workspace, the next time you open that Workspace the only 6 tabs you'll see will be your 6 different client's Twitter Notifications tabs. This is great for people who tend to open a lot of tabs while working but would like to return to a 'clean' workstation every day. 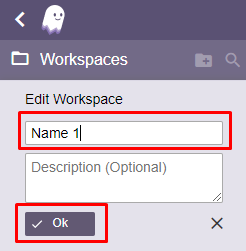 You can rename your Workspaces in order to make Workspace contents easy to identify at a glance. 1. Hover over the Workspace you want to rename and click the overflow menu (3 dots). 2. 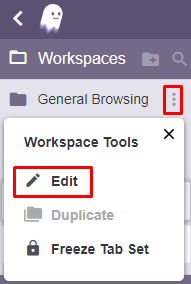 Select Edit Workspace from the menu. 3. Rename your Workspace and click Ok. If you're someone who loves to check things off a to-do list (me!!) then you're going to love the ability to Archive a Workspace. Archiving a Workspace is a great way to keep track of your progress and also keep your workspace clean. The great thing about Archving a Workspace instead of deleting it is that Archived Workspaces can be Restored. Deleted Workspaces cannot be restored. 1. 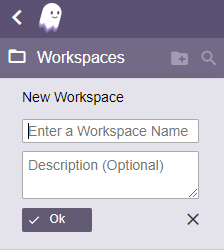 Click the box to the left of the Workspace title to Archive the Workspace. 2. It will display as Archived and move down to the archived Workspaces section at the bottom of the Workspace list titled, Archived Workspaces. Deleted Workspaces cannot be restored. If you want to temporarily archive a Workspace you can do that by Completing the Workspace. Instructions to Complete a Workspace can be found above. Hover over the Workspace name and click the overflow menu (3 dots). From the menu select, Delete Workspace. Note: Your "General Browsing" Workspace cannot be deleted or Renamed. More information about the General Browsing Workspace. Need help? Contact us .